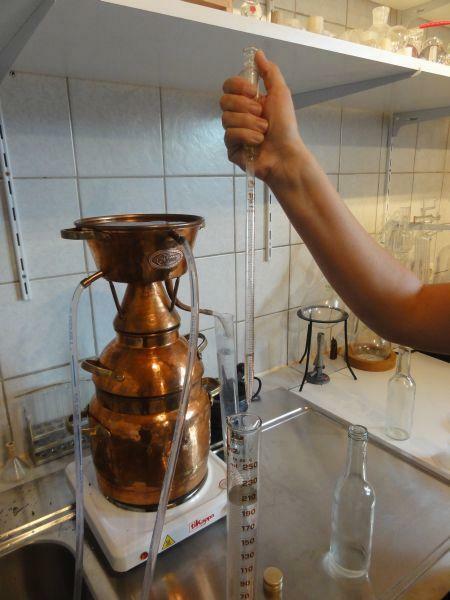 Alquitara = the uncomplicated still for the production of essential oils and aromatic schnapps. The Alquitara still offers an amazingly simple and functional method to obtain excellent results. The perfect still for distilling essential oils and aromatic spirits. Why does the condenser of a still have to be positioned on the side? On the alquitara still, the condenser is mounted on the top and cools the rising distillate immediately. Amazingly simple and functional, especially for the production of essential oils and simple schnapps. 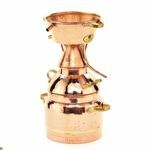 New in our product line: We have opened the alquitara in the upper boiler area and forged a convenient aroma basket. The result is guaranteed to be the best still for the production of essential oils. On this page you can find alquitara stills from 0,5 bis 50 litres for essential oils and alcohol. Are you looking for something bigger? Click on the category for bigger alquitaras. There you will find alquitara stills with boilers from 100 bis 300 litres.